Dogged by cost and ridership concerns since it was first proposed nearly 10 years ago by then-Mayor David Cicilline, the proposed streetcar has been abandoned in favor of an “enhanced bus” line along the same route, Providence Planning Director Bonnie Nickerson confirmed Wednesday. In a list of future projects the city wants added to the state’s upcoming 10-year transportation plan, the Providence Enhanced Bus Circulator is estimated to cost $20 million. The proposal asks for $7 million from the state to build the new bus line and uses a $13-million federal grant awarded for the streetcar in 2014 to cover the rest. The enhanced bus plan would keep the streetcar’s most recent route: from the Providence train station through downtown and the Jewelry District to Rhode Island Hospital. I’m sure I have a lot of thoughts and opinions about this which I have neither the time nor the energy to think about right now. However, I wanted to provide a place for others to discuss, one thing to consider when assessing this change in planning is what Providence is asking for in the TIP. While many were about street repaving and bridge repair, I think noteworthy is that the Providence streetcar is abandoned. Instead they propose, paid for partially with their streetcar TIGER grant, a downtown bus circulator on much the same route. They also ask the TIP to include a 6/10 boulevard study and a bus hub at the train station, and ask for a bus lane on North Main St., pedestrian crossing improvements on downtown streets (especially Memorial Blvd.,) wider sidewalks between the train station and Kennedy Plaza on Exchange St., a Sabin St. bike lane, a Delaine St. extension to avoid Olneyville Square, Providence River dredging, a pedestrian bridge over Route 6 at Riverside Park, and enhanced bike route development along Kinsley-Promenade to the Olneyville area. I suggest others use the link gcpvd provided to check this out. Then we perhaps look to something like Roger Leaf’s Green Way proposal as a light rail solution for the urban spine of the State. Providence needs to explain why $20 million is needed just to have a short bus line on the streetcar route. At the Dec 1 conference on “Making transit work” the systems invited because they all some success (Denver, Hartford, Minneapolis) all had some kind of free (in the first two cases) or low cost (in 3rd) downtown bus routes. So does New Haven where I’ve actually used the CT Transit free shuttle from the train station to the central NH Green. Portland OR and Seattle also started on transit renewal by first putting in a downtown free-fare bus zone even before building any infrastructure. It helped both revive their downtowns (Portland was considered a failed city when I lived nearby in 1974) and got middle class people used to actually riding transit. We have done the opposite, eliminating the low-cost downtown “short-zone” (in 2003?) so that is it is $2 to go from State House to Kennedy Plaza etc and giving free rides to about 30% of all riders to reinforce that bus transit is really just a charity for the poor. So I hope operating funds can be found to make this proposed “enhanced bus” route free so we can start to build the culture these other places did. This may not be on topic; but any idea why the Pawtucket Commuter Rail station is not mentioned. This may be the reason for the emphasis on the North Main Corridor. To my way of thinking if you take away the streetcar the next highest statewide priority should be on the Pawtucket Commuter Rail Station, because this opens up the potential for rail service to Boston and also to Worcester by way of Woonsocket. Pawtucket isn’t mentioned because this is a Providence Planning Department project. I will assume they need 20 million to buy enough buses to have a decent and consistent headway and maybe a different branding to set them apart. They will also probably have to modify stop lights to give buses priority at all intersections in the loop. Not sure if that’s 20 mill but there are probably other infrastructure improvements that could be made like equipping the buses with GPS so people can track them in real time. They should do this for all of RIPTA but if the TIGER grant gives them the money with this initiative go for it. by the train station. Now that Dorrance is two-way it would be easy to take a left off Washington, a right on Finance loop around the station and then back to Kennedy via Exchange or just send the buses up and back on Exchange. Then they should figure out a way to offer free passage for people moving between just Kennedy and the train station. $20 million for a shuttle bus from the train station to the RI hospital? What a scam. I know people on this forum love buses, and frankly… I’m a little confused to why on multiple levels but this isn’t about that so I’ll check that at the door. Does a bus line increase property values? Hmm.. I don’t think so but I don’t know. Prove it to me. The streetcar would have added value and additional tax revenues. I don’t see how this is a real value add at all (relative to the streetcar plan). Yes… it is “cheaper”, but as far as “value” is concerned, I think $100 million on something that could add $1.1 BILLION in property values in the surrounding area is a far better deal than $20 million on something that adds $0 to property values. Additionally, not to sound like a snob because I am not one. But I think a big part of this project was that people who would never ride bus transit would ride this streetcar line. The students, the East Siders, tourists, and business people passing through will not ride a bus. This is an expensive bus line for low to lower middle class Providence residents and out of town hospital workers. I’m just appalled at everything about this plan. I’m pretty upset about this although the whole project was one giant risk. Providence and the rest of Rhode Island needs a top of the line rail transit system with Right-of-Way to get ahead of the pack. I don’t think BRT will be the only way to go for Providence obviously. We can’t single out streetcars or any other forms of rail transit but first, Providence and the rest of Rhode Island needs to get serious about bicycle infrastructure. Nothing is going to change dramatically until RIPTA gets a massive boost in funding and RIDOT treats transit as their main priority. It’s really hard for a metro area to have a good transit system when the state government barely supports you. You can’t just rely on federal grants alone, which brings me to the point that USDOT needs to help fund transit systems way more than it currently does. The TIGER grant program isn’t enough to transform public transportation in the United States. I don’t think the streetcar was a smart investment. I think it was a case of putting the cart before the horse. Large transportation initiatives need to be approached organically – and region-wide – and not piecemeal, city-by-city or line-by-line. Rhode island/SE Mass desperately needs a completely revamped, region-wide transportation system to spur economic growth and to give it a competitive boost. Start with the bigger picture and fill in the details as they become clearer. What are the needs of the population? BRT, buses, light rail, HOV lanes, bikes, walking – how do the modes complement each other and connect, both in terms of time and place? If a streetcar plan develops as a result of this approach, then it makes sense. Let’s move on to making the R-line rail with dedicated ROW where possible and move on to planning an expansion with an E-W line from Olneyville. Extend an east-west line from Olneyville (or even Johnston) through the mothballed rail tunnel to East Providence. The elimination of the streetcar proposal makes a non-bus east-west line from Olneyville to downtown even less likely. This was a big defeat for intracity non-bus transportation in Providence. I agree we need better ways to get INTO Providence, as part of a regional mass transit rail solution/network, but this isn’t about that. This is about travel WITHIN the city, and expanded buses — even if it is “enhanced” — does not get us where need to be. The problem the entire time was that the costs weren’t allocated enough to the Universities and the Hospital. This should have been a 4-5 phase plan to connect all the colleges to the train station. It was communicated poorly, and the financing was poorly conceptualized as well. Very short-sighted. I hope this doesn’t mean it’s off the table for good. I’m preaching to the choir here, but $20M investment in buses has an ROI of *zero*, while it’s proven time and time again that investment in rails has a significant ROI (to your point KCB). How does Peter McNally feel about this?? 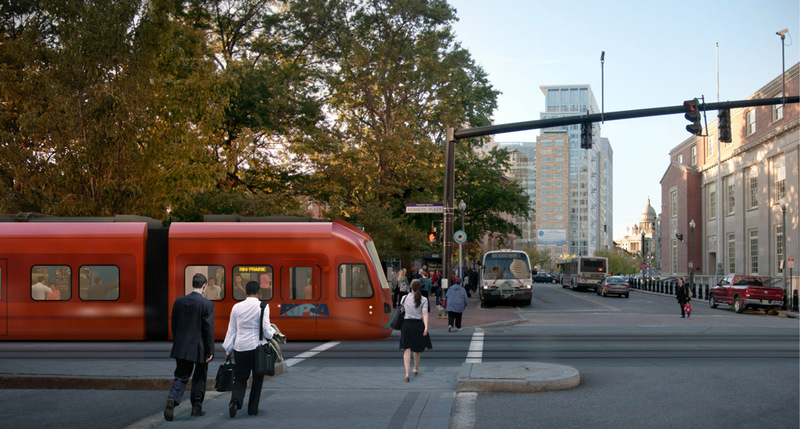 A streetcar is a much better selling point from an investment standpoint than buses. I’m sure he’d much prefer to try and sell the 195 land to developers telling them a streetcar is coming… I.E. property value will go up! Normally when I drive around, I see the potential of the vacant land, but this morning, after reading about this, my glasses were a little less rosy. At some point, the streetcar was meant to go down Prairie Ave. Prairie Ave has the feeling of being just one notch up from a residential street, and is mirrored by several other really busy corridors (Allens, Elmwood, Broadway). It would be great if the bus line made a straight-shot down Prairie, but with filtered permeability. In connection with 6/10, I’ve also thought at times that the best thing would be just to have a bus that starts on the Providence College or RIC campuses, comes down Dean Street, and then through the various versions of Dean (Cahir, Stewart, Prairie). If that happened, it could be a really important W. Side version of the R-Line, going north-south. That also could be enhanced by either getting bus lanes (on wide parts of the route like the Dean St. Bridge, or Cahir) or filtered permeability (on narrower parts, like Prairie). If we built a north-south route that was frequent, then maybe the east-west one would just have to interact with it for transfers, rather than double it. I wrote my comment quickly on my phone last night, but I really meant it. 1. Didn’t connect to RIC/Providence College/JWU Harborside. Doing a full on university connection with hospitals and downcity with some higher commitment that I think could be rustled for such a plan would have helped a ton. 2. It never did a good job of articulating a system of expansion other than throwing random arrows on the edge of a map. 3. This is most important: The R-Line killed the streetcar by generating a lower value project along the most attractive route for transit enhancement. An R-Line-based route (or something closer to that alignment) was always better, but was never an option because of the R-Line investment. We should always have had some form of N-S/E-W-type alignment as the start of a system, with clear connections to the existing rail corridor in Olneyville and Pawtucket/CF that traversed the most densely populated and highest transit-use portions of the city. I see the city’s still peddling its plan to invest transit money in places where transit demand isn’t that strong, rather than on the stronger corridors (11, 99, something serving Olneyville, the bus tunnel, etc.). Why waste money on one mixed-traffic streetcar when you can waste it on many bus circulators? If cost wasn’t an issue, stuff like ROW, low headways, and signal priority would’ve been a part of the streetcar project from the start. Looking back on it the streetcar should’ve been about making transit in an area where there’s high ridership better but to be honest, the routing of the streetcar wasn’t the big issue. At the end of the day, even if the streetcar project was flawless, it still would’ve been canceled because of lack of funds. By expanding the stakeholders, the City could have really offloaded costs. Just look at the New Balance/MBTA/City of Boston partnership as an example. There are so many people that would benefit from intracity transit enhancements. The City could have enacted an annually student fee that every college would have had to collect by including it in the tuition fees. It could be smaller than what the MBTA charges, since the system is not as built out, and it would create consistent revenues to build out new lines. Some portions of the streetcar line could have certainly had dedicated right of ways (ROW)… the majority of Broadway to the decline prior to getting to Olneyville Square could have had a dedicated ROW, although there would have to be a small idle as the highway crossings were navigated. Not a big deal. The first route should have included the East Side and Brown should have paid the majority of it, along with the half of the southern route near Ship Street, which they would have been asked to split with RI Hospital. It would have been the easiest way to demonstrate the model, and it would bring much needed foot traffic downtown during off hours. The City should have asked URI/RWU/RISD to take the lead on the “core” downtown route. PC/RIC would have taken the lead on the development of the Smith Street route. Additional lines could be built off those, but the primary scope of the purpose for the streetcar network should have been promoted as a way to connect the colleges to downtown. Making it an asset to institutions and private business, not an irresponsible waste of taxpayer money. It would have had predictable fares, not optimistic ridership forecasts. 40,000 college students (conservatively) x $480/year ($40 x 12 months) = $19,200,000 PER YEAR! Not including public fares (which would only be charged outside of the “free core”). The colleges could have been asked to contribute a certain amount for the build-out, maybe 10-20% or something. The phase 1 line would have paid itself off in like 3 years, just about the time a new line would have passed all pre-development milestones and financing planning. This is not rocket science, this thinking that college students can’t contribute to the community they call home, at least temporarily, is so wrong. The colleges should be paying for the new infrastructure in some form. Never understood the routing from on an Urban Design or ridership basis. More institutional support would have been nice; but the lack of political support may have also played a role. Simply did not do anything for the broader community that people could buy into. A free downtown circulator would do just as much for the I-195 parcels and perhaps for less money. The R line already has the potential to connect the rail station to the proposed Pawtucket station creating an expanded transit shed. A Down CIty circulator could easily do the same for DownCIty and the Jewelry District. Oakland CA has a free circulator that links their Amtrak Station to the BART system providing access to shopping, multiple transit options and former industrial areas that are being redeveloped as housing and office (pixar, novo nordisk, etc.). To have a free shuttle here will require ripta to achieve more robust operational funding, also needed to extend service hours on key routes, keep the terminal building open in the evening, hire people to clear snow from shelters, do some marketing, etc etc. Unfortunately, it seems that any additional $$ squeezed out of the legislature is likely to just go for subsidizing senior/disabled fares as many of them object to even the 75% discount they are now offered. For big capital projects in this political climate, forget drawing streetcar lines on maps, fun as it is, I think the only plausible development is to take better advantage of the existing corridor rail infrastructure for faster intrastate travel and Peter has done a good job outlining some of its potential. That can benefit the whole region. But none of this will do much good unless we do more to level the playing field with the subsidies given to pervasive “free” parking. Even now, with climate change, urban redevelopment, talk of millenials, we are about to spend $45 million or so for a 1250 space parking garage at the Garrahy Court, more of the State House area has been paved over for parking, URI-Providence still offer (expensive) free parking to all but no transit incentives as do many private employers who largely have ignored supporting the “Ecopass.” Meanwhile, to make up for the free riding, fares for those who do pay, especially frequent riders already paying above average fares, are getting even higher. Unless this is addressed, capital projects and tinkering with routes, though needed, will do little good. In a way, Providence has the worst of both worlds, not enough easy parking near the door to compete with suburbia so it still needs a transit system, but too much parking to avoid congestion, maintain its beauty, or to have its transit system succeed. And, as I may have posted before, Seattle and Portland OR started redevelopment by establishing downtown fare-free zones to rebuild a transit culture and to reestablish interest in their downtowns, before any of the local rail infrastructure was in service. What RIPTA could do is have the Providence Link Trackless Trolleybus Routes 6 92 & the R Line operate as a Bus Rapid Transit System. Having the R-Line called the Green Line, The 6 Trackless Trolley called the Yellow Line & the 92 Trackless Trolley Route call the Brown Line.